QUESTION: I get up in the morning, make coffee and read your blog. Thank you for your service to humanity. Ok, so the Democrats want to go back to the 1950’s with 70% tax rates. Does that also mean they’ll reinstate the same deductions that were available back then? For example, passive activity loss rules would go away, personal credit card interest, medical expenses, and job expenses would be deductible, companies could deduct meals and entertainment, vehicle expenses, corporate jets etc. Also, there was a tax credit of 10% of the cost of new and used equipment placed in service. It is unfair to look only at the tax rate without looking at how taxable income was calculated. And how about Social Security tax being applied to a few thousand of earned income. ANSWER: No. They will never put back all the deductions. This is all about raising taxes for their claimed Socialistic Agenda but in fact, as the deficits rise and interest expenditures explode, they will be raising taxes sharply as they always do pretending to be taxing just the super-rich. They NEVERlower taxes on the middle class. They just point to the rich to raise taxes without any benefit to anyone else. Normally, the play games with the definition of the rich. The Trump Taxcut denied deducting what you pay in taxes to a state after 10k. They blame Trump for that yet this has been on their wish list for the past 30 years. If the Democrats get hold of the White House and the Senate, you can bet your life they will not change that deduction. They silently all cheered for that – both Democrats and Republicans. 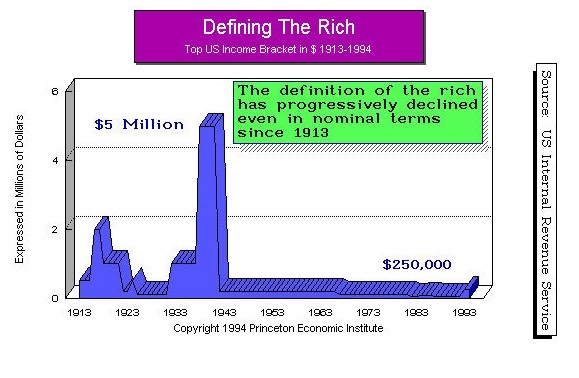 The Definition of the rich has always been classified as “household” income. The burden of student loans preventing the youth from leaving home and buying their own house is wiping out the economy. It has reached a 75-year high coming in at a stunning 40%! The impact of this is the call among Democrats behind the curtain to get the IRS to add all the incomes in a household including the children to push them higher into the category of the “rich” which starts at the $250,000 level – not $10 million. The plan will be to raise the taxes on the rich and the define who are the rich. They will NEVER tell you the truth to your face. This is all part of the decline and fall of Western society.